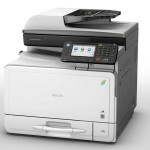 The Ricoh Aficio MP C305 SPF is a Multifunction color copier, which is capable of copying, printing, scanning and faxing, a truly all-in-one solution. 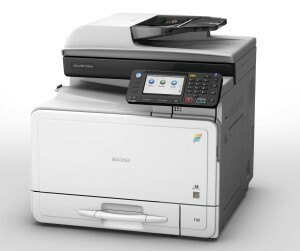 The Ricoh MP C305 can print up to 31 pages per minute in color and black and white. 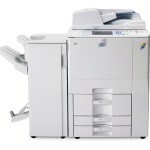 The Ricoh MP-C305 SPF Copier combines easy to use controls, flexible performance, secure usage and energy savings in a powerful yet compact solution that is designed for convenience and affordability. 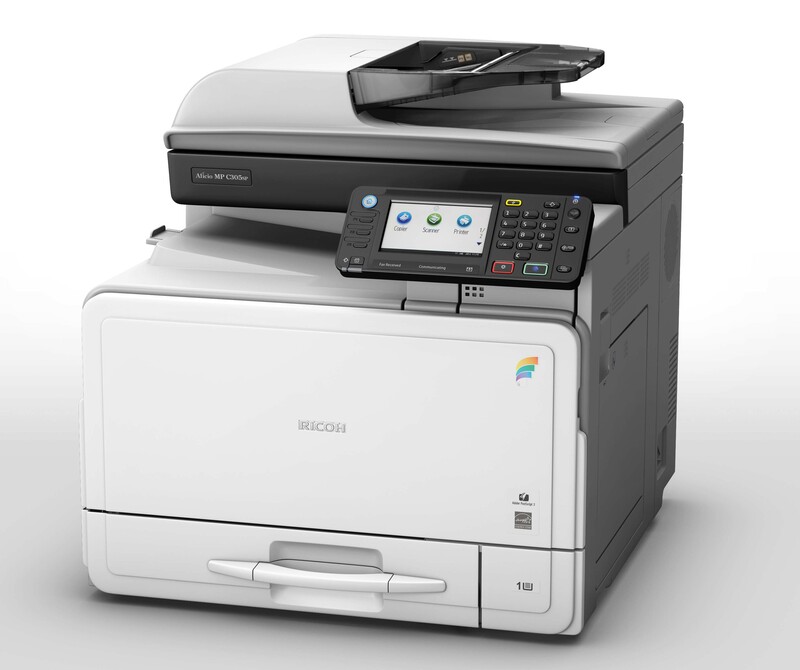 The MP C305SP/MP C305SPF provide all the colour printing, scanning and copying functions you need from the comfort of your desktop. Operation is easy via the tiltable 4.3-inch colour touch panel. 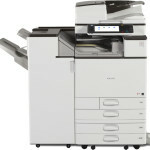 Ricoh’s next-generation platform including the new GWNX controller gives you the same capabilities as the newly launched A3 devices. The simple cube design optimises space. The customisable 4.3-inch colour touch panel takes usability to a new level. You can customise the home screen by inserting your company logo and changing the icons. You can also register other applications, such as GlobalScan NX to display large and clearly visible buttons for easy input of email or folder addresses on the operation panel. 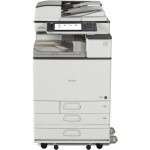 With a short warm-up time and high print speeds you can accelerate your work. The MP C305SP/MP C305SPF’s extra paper trays make sure frequent refills are no longer required. 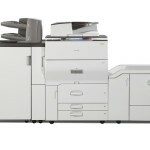 Furthermore, these are the first A4 desktop MFP models to support a 1-bin tray which fits inside the standard catch tray. 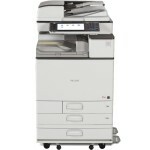 It can be used to separate important output such as inbound fax communication. 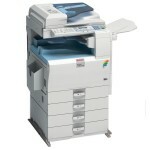 Scanning capabilities include colour scanning, and scan to email, folder and USB. For compliance procedures, use Scan to PDF to create a digitally signed PDF. With the reduce/enlarge scan function you can adapt the paper size. You can scan only printed sides of one-sided and two-sided mixed originals with enhanced batch scan. 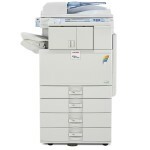 The MP C305SP/MP C305SPF give you enhanced device management capabilities normally seen only on A3 MFPs. The high-performance GWNX controller allows you to configure device settings, monitor status, and create reports of usage. You can save time, increase your efficiency and reduce costs. To reduce the number of unnecessary prints/copies, you can set limits on the amount of outputs of each individual user or groups. 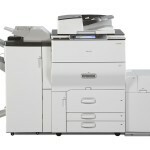 Duplex printing is standard and helps you reduce the volume of printed documents and save paper. 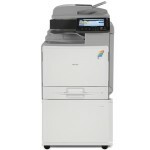 The MP C305SP/MP C305SPF incorporate Ricoh’s new Quick Start Up (QSU) fusing system. This slashed the Typical Electricity Consumption (TEC) values of these devices. Furthermore, QSU reduces both the recovery time from sleep mode and the initial warm-up time.